Portable Sump Pump helps prevent "water in the basement"
In many houses, submersible sump pumps are as important to a comfortable home life as basic electrical and plumbing fixtures. Submersible sump pumps were created to eliminate that fear that can arise on heavy rain days, or any day the underground water table rises to threaten your dry basement. Submersible sump pumps sit in a water-accumulating sump pit, and pump excess water away from the house foundation. Our newly improved portable sump pump has a higher stand-off base plate to prevent debris pick-up in the sump pit. 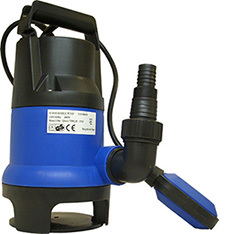 1/2-HP, portable sump pump offers a maximum flow of 2,000 gallons per hour, and includes an adjustable tether switch, extra long cord, and multi-fitting elbow. 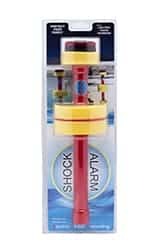 This submersible sump pump, specially sealed to prevent electrical short circuits while under water, can save you untold hundreds, if not thousands, of dollars by helping to prevent water in the basement. A portable sump pump (not permanently installed) is perfect in situations where flooding doesn't often occur; you'll use that portable sump pump anywhere flooding is an immediate issue.